A simple salad appetizer topped with slippery liver that's been sautéed lightly and finished with a little shallot-wine sauce thickened with crème fraîche. Nothing too tricky and everything is delicious…except the liver. If I had used foie gras, the perfect substitute, I could tell you all about how foie gras is made and possibly get into trouble from activists about how geese are force fed for the last few weeks of their lives. Do the geese mind the funnel-feeding? Does the liver of ethically-raised geese who naturally gorge themselves taste better than geese that have been force fed? Unfortunately, I didn't have time to run out to buy this delicacy as I had intended to. "Every good chicken has a good liver." But I do have a bit of time to think, read and ponder foie gras. Before I knew much about it, I had tasted it and found it smooth, custardy, salty, rich and good. Pan fried lightly in a touch of butter, ending with a bit of a crust and a smooth, velvety center, it was memorable. It was served as part of the main dish at a restaurant that was paying tribute to Julia Child shortly after she died. I ordered Tournedos Rossini (Filet Steaks with Foie gras, Truffles, and Madeira Sauce) found on page 299 in Mastering the Art of French Cooking, Volume I: 40th Anniversary Edition. But the fois gras is what stood tall in my memory banks. And how different is fois gras (besides cost!) from chicken liver? I wish I'd had the time to source some fois gras this week just to compare the two offals. "On a ritz, on a stick, in a box, with some lox...Chicken Liver." Working through this curriculum, I've made several dishes that I wouldn't normally come home from work and choose to make. Frog legs, chicken liver, caul fat encased sausage and soon rabbit are examples. Why does the vision of Hannibal Lecter whispering in my ear linger each time I'm about to sample something unfamiliar, causing me to take a deep breath before taking a taste? Why don't I feel guilt or discomfort when I put a piece of beef tenderloin in my mouth? Is it any different? No, it's just more familiar. 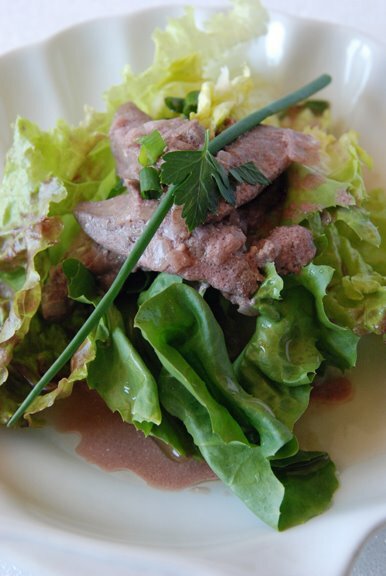 You can find the recipe for Salade de Foies de Volailles Tiedes (Salad of Warm Sautéed Chicken Livers) in the book Le Cordon Bleu at Home or here. To see how the rest of the Whisk Wednesdays group fared with their recipe, click here (or check out the sidebar) and then click on each blogger! I did a tasting and confirmed that chicken liver is not for me. The vinaigrette was tangy and the pink color of the sauce on the liver was pretty. But next time I'll use regular chicken breast or foie gras instead. Taste fois gras from Eduardo Sousa's farm. Interesting. My friend would probably love this recipe, but I'm not so loving of chicken livers. Thanks for sharing. I've never had chicken liver, but I understand your reaction to "abnormal" protein sources. It's the same one I had when I tried cow tongue the first time. Always the issue with unfamiliar meats, huh? I don't think I would love whole chicken livers or even very big chunks of them. I like them pureed with other things though. The sauce and the salad sound delicious. I'm scared of liver. Great that you tried it! The salad sounds good on its own. This is so funny, beucase I just made chicken liver pate last week!. Chicken livers have been on my mind ever since. I went spanish with my pate (with a pickled grape and sherry vinegar gelee), and the went vienamese (banh mi) the next day! So excited that we are scared of these slippery friends. Kudos to you for your bravery and spirit of participating at full tilt! When I made the dressing up, there was a lot, so I put it in the frig and after a couple days had some on a salad...it was even better after the flavors had a chance to be together for awhile. Your post was fun and the photo looks great...if only I didn't know what it was...LOL! I really don't prefer to have chicken liver if given a choice.But I guess the presentation looks extremely good and hence will taste also the best. You have asked some good questions. And, you made the blog post extra interesting. You know, I've never had chicken liver or foie gras. I think it's about time I venture into the unknown territory of these delicacies, eh? This salad looks fantastic! Not a big fan of chicken liver in this form and I have to agree that foie gras would be perfect! 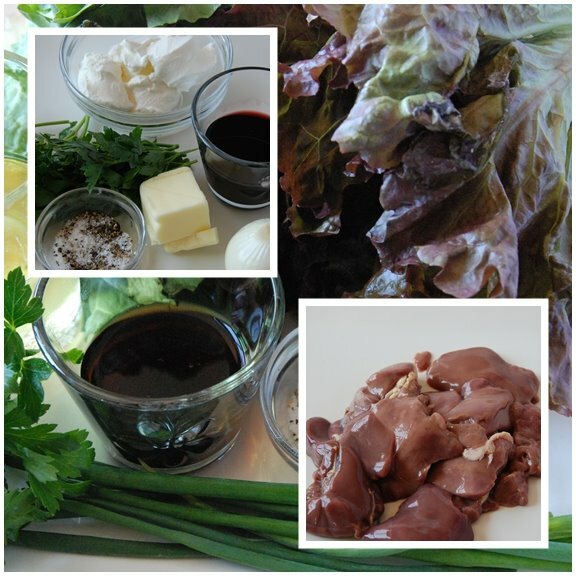 I adore chicken livers and this salad looks like a great way to use them! I will have to try this one soon! I like liver as long as I don't cook it. Wonderful salad. I'm not gonna lie, but this isn't something that would ever appeal to me - which says an awful lot about your skills in my opinion because that first picture of the salad looks really appealing! I've not been able to eat liver most of my life. My mother said I liked chicken livers as a baby...but what did I know then? I'm prepared to make this...for Bruce. And I'll taste it. If I can. It's the experience, right? But foie gras? Right there with you Shari!! Foie gras is a beautiful thing and the liver or any animal is beautiful. I could go on my rant about how goose's throat is hard as fingernails, the gavalage only takes a short time, etc but I will refrain. Instead I will just say a simple beautiful done and perfect!